Thumbs up on this one. It is very good. Yeah I've seen English blends that had Orientals in the mix. It seems to me that Balkan blends are simply English or perhaps Scottish blends that are just more Oriental forward. My solution to this conundrum is to just call them Latakia Blends when they are more Latakia forward. When they are Oriental forward, Oriental blends. It's not uncommon at all to hear about Burley or Virginia blends in the same context, and using the same classification method just sort of makes sense to me. The English don't get to claim the credit for such a wide swath of blends.. Sounds good to me, the lines have been so blurred when it comes to these things that it gets confusing to people. Of course one immediate problem is that a Latakia forward blend is in actuality an Oriental forward blend because Latakia is simply an Oriental that has been smoked. LOL! My solution as well only because I separate my pipes (actually my Falcon bowls) based on the blends. I group them as Aromatics, Burley, Latakia, Straight Virginia's and VaPers. 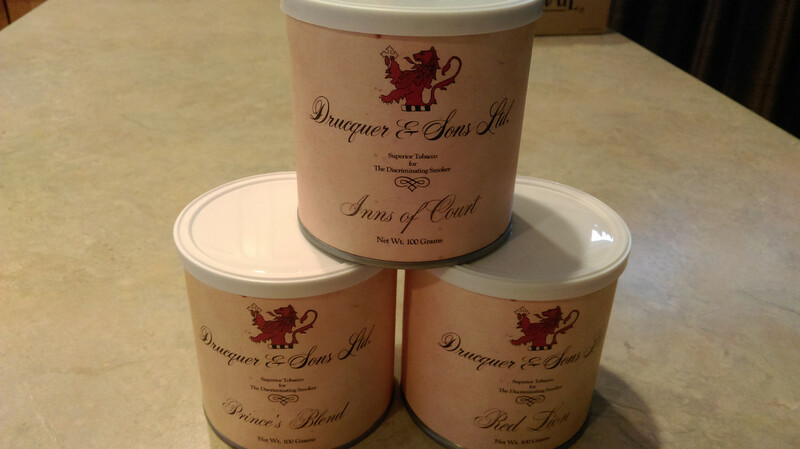 Right now, tastes and times change, my favorite "English" blends are Drucquer & Sons Inns of Court, Prince's Blend and Red Lion. They all consist of the same components but diffrent proportions create the individual blends so all three are worth having on hand. I've noticed a huge similarity of the cuts and even tastes of these to D&R blends. Is C&D outsourcing?